Why is Emily Wilding Davison remembered as the first suffragette martyr? “She paid ‘the price of freedom’. Glad to pay it — glad though it brought her to death (..) the first woman martyr who has gone to death for this cause.” In the context of the women’s suffrage campaign who do you think was the subject of this eulogy? Was it Emily Wilding Davison, the centenary of whose death is being honoured this June? In fact the words are taken from the obituary for Mary Clarke, Emmeline Pankhurst’s “dearest sister”, who died in 1910, two days after being released from Holloway, her imprisonment a direct result of her actions as a suffragette. 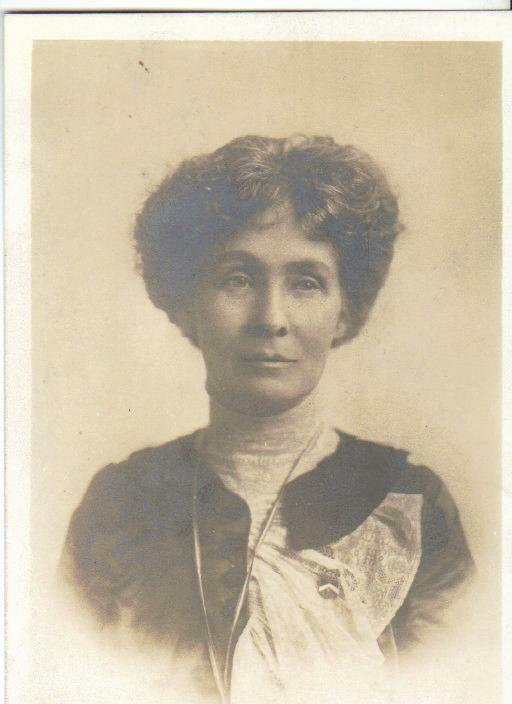 The obituary, published in Votes for Women (6 January 1911), was written by Emmeline Pethick-Lawrence, one of Mrs Pankhurst’s co-leaders of the Women’s Social and Political Union (WSPU) and explained that, to bring women freedom, “Mary Clarke laid down her life [and] faced ridicule, blows, hard usage by roughs, the handling of the police, and three imprisonments.” After this eulogy why is Mary Clarke forgotten and it is Emily Wilding Davison who is hailed as the first martyr to the cause of ‘Votes for Women’? Unlike Emily Davison, Mary Clarke was not merely a member of the WSPU, but one of its inner circle, fully involved in the campaign from its early days, twice imprisoned after taking part in deputations, and, from mid-1909, based in Brighton as a paid organizer. Her final imprisonment came at the end of November 1910; she had thrown a stone through the window of a London police station. On 23 December, on her release from Holloway, she spoke at a WSPU ‘welcome’ luncheon and two days later, aged 48, died of a brain hemorrhage attributed to the strain of her prison sentence. Her sister, Emmeline, was at her side when she died. Why did Mary Clarke, ‘the first woman martyr who has gone to death for this cause’, not receive from the WSPU a splendid funeral, on a par with the published encomium? Her funeral was, in fact, very quiet; as Mrs Pethick-Lawrence reported “There was no singing at the graveside, for owing to the break-up of the holidays the funeral was private and but few were able to be present.” But such by now was the power the WSPU could exert over its members that, holidays or not, if it had decided to make a public spectacle out of the death of Mrs Pankhurst’s favourite sister, a public spectacle there would have been. The answer lies in the politics of the day. In early January 1911 a general election was underway and it was not advantageous for the WSPU to divert resources away from their campaign of opposing Liberal candidates. Nor, of course, was January a good seasonal moment; the first London suffragist rally, held in February 1907, wasn’t named the “Mud March” for nothing. By summer 1913, however, the climate, in every sense of the word, was very different. Since January 1911 the WSPU campaign had become increasingly militant, its leadership undergoing dramatic changes. Together with her daughter, Christabel, who had fled to Paris to escape prosecution, Emmeline Pankhurst was now sole leader. In April 1913, found guilty on a charge related to the bombing of Lloyd George’s house, she’d been sentenced to three years’ penal servitude. A dynamic series of reactions followed, resulting in Mrs Pankhurst spending successive periods in prison on hunger strike, before under the new “Cat and Mouse Act” released to recover, while many of her followers were roaming the country, on the run from the police. Emily Davison was not one of these outlaws, although, at the end of 1911, by setting fire to a pillar box, she had instigated a new level of militancy. She had served her sentence in Holloway, some of the time on hunger strike, but since her release hadn’t been directly implicated in any attacks on property. By early June 1913 the atmosphere among WSPU members was febrile. The government was tightening its hold on the WSPU, doing all it could to deprive it of funds, members, and publicity. It’s in this context that Emily Davison’s action at the Derby and the WSPU’s reaction must be viewed. By undertaking a dangerous action, in front of the newsreel cameras on one of the most popular holiday-making occasions of the year, Emily perhaps thought to draw the world’s attention to Mrs Pankhurst’s predicament. Her action, though fatal for her, was fortuitous for the WSPU. It was by now impossible that the Home Office would have given permission for a suffragette rally per se, but to have opposed a funeral procession would have, literally, fuelled the flames. This was a final opportunity to reclaim the moral high ground, to demonstrate the dignity and solidarity of suffrage campaigners, compelled, as they saw it, by an intransigent government to employ methods of last resort. 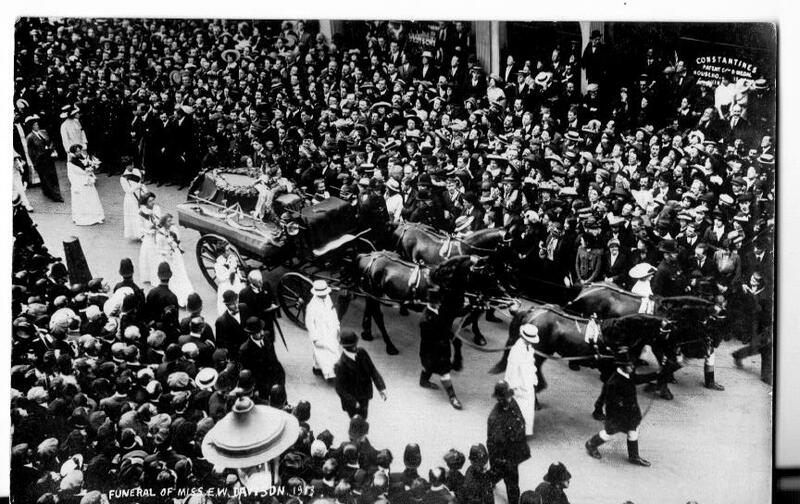 Emily Wilding Davison’s funeral procession approaches St George’s Church, Bloomsbury, where a service was held. Thus it is that Emily Wilding Davison has been remembered as the epitome of suffragette sacrifice, her ‘Price of Liberty’ published in The Suffragette (5 June 1914), while Mary Clarke went quietly to her grave, ‘the price of freedom’ she paid quite forgotten. Elizabeth Crawford is an independent researcher and the author of The Women’s Suffrage Movement: a reference guide 1866-1928 (Routledge, 1999); Enterprising Women: the Garretts and their circle (Francis Boutle, 2002); The Women’s Suffrage Movement in Britain and Ireland: a regional survey (Routledge, 2005) and Campaigning for the Vote: Kate Parry Frye’s Suffrage Diaries (Francis Boutle, 2013). Her website Woman and Her Sphere contains a wide range of material relating to the women’s suffrage movement, as well as other areas of women’s and social history. She is the author of “‘Women do not count, neither shall they be counted’: Suffrage, Citizenship and the Battle for the 1911 Census” in History Workshop Journal, which is available to read for free for a limited time. Since its launch in 1976, History Workshop Journal (HWJ) has become one of the world’s leading historical journals. Through incisive scholarship and imaginative presentation it brings past and present into dialogue, engaging readers inside and outside universities. HWJ publishes a wide variety of essays, reports and reviews, ranging from literary to economic subjects, local history to geopolitical analyses. Subscribe to only historyarticles on the OUPblog via email or RSS. Táhirih was the first woman’s suffragette martyr in 1852. Look her up. Unless you are only considering the western world.